A beautiful climbing plant from India, belonging to the Periwinkle family, Apocynaceae. 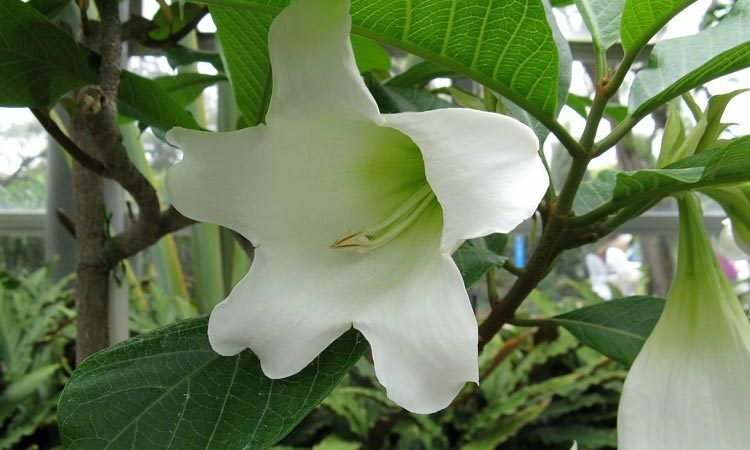 It forms a woody stem, clothed with leathery green leaves, and bears large, white, trumpet-shaped flowers in spring. It must be grown in a house having a minimum winter temperature of 55 degrees or may be planted outdoors in the deep South. The name commemorates Mary, Duchess of Beaumont, a patroness of botany in the early 19th century. The plant is of rampant growth and a large greenhouse or conservatory is required for its cultivation: it is unsuitable for pots. Cultivation. 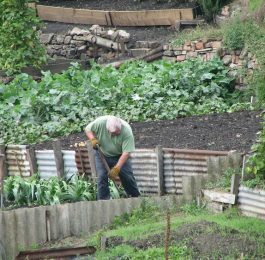 The best results are obtained by planting in a deep, well-drained bed of soil; a hole 3 ft. deep is dug, drainage is put in and covered with turf, the remainder of the hole being filled with equal parts loam, leaf mold and peat. Planting is done in autumn or early spring, and wires are fixed to afford support for the shoots. Water is given freely during the summer, but less is needed in winter; however, the soil must not be allowed to become quite dry; if this occurs the plants are injured seriously. Pruning and Propagation. The side shoots should be shortened by two thirds after the flowers are over. Young shoots are inserted in sand or sandy soil in spring, in a propagating case kept close until the cuttings are rooted. They are then potted separately in small pots and subsequently in 5 or 6-in. pots, whence they are planted in their permanent quarters.